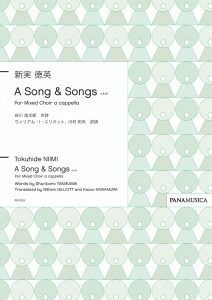 This is the mixed chorus song collection that contains 7 son gs including “A Song”,Tokyo International Choral Competiti on compulsory piece, which has written with both Japanese an d English in poetry of Shuntaro TANIKAWA’s “minimal” and the English part is used as the lyrics. Utilizing the rhythm and accents of uniqueness of English, and every songs have melodies, rhythms, and harmonies which had never been born w ithout using Japanese poetry. As the composer says, "The dis tance between English and I has made it possible", you can f eel the new aspects of new works from this collection.